Image is everything. Trust idproductions to make your customers first impression of your website count. We do not offer or promote a "one size fits all" solution for website design. No matter what your specific website needs are, idproductions can develop a solution that is best suited for you and your buisness. It is important to realize that your website will always be a work in progress. You should plan on having your content updated on a regular basis to keep your website fresh and your customers coming back. idproductions can create an eCommerce site for you based on the CS Cart shopping cart system. We've looked at several shopping cart systems and fell that CS Cart offers a ton of great features for a very affordable licensing fee. For more control over your website content, idproductions can build your website using the WordPress content management system. Originally designed primarily for blogs, WordPress is now capable of being used to manage the content of your entire website. We can enhance your website with custom graphics ranging from simple buttons to a new logo. Prices for basic graphics will be included in the quote for developing your website. Services such as banner and logo design will be billed and listed separately. Nearly 25% of all website traffic comes from mobile devices. Your website should be mobile friendly to deliver the best possible experience for your mobile viewers. You only get one chance to make a first impression on your customers. Whether you need a basic website or an ecommerce website we are quite confident that we'll have a solution for you. At idproductions, we take the time to assess each clients individual needs. We do not offer or promote a "one size fits all" solution to website design. We want your web presence to be an accurate reflection of your business. No matter what your requirements are we will work together with you to develop your home on the web. Our client requested a simple, yet effective logo, for their high end brand of cables. The logo we created provides the visual impact the client desired and was the perfect companion to their new product line. Our client wanted a simple and whimsical logo for his new internet based company. We are currently developing an ecommerce site for them. 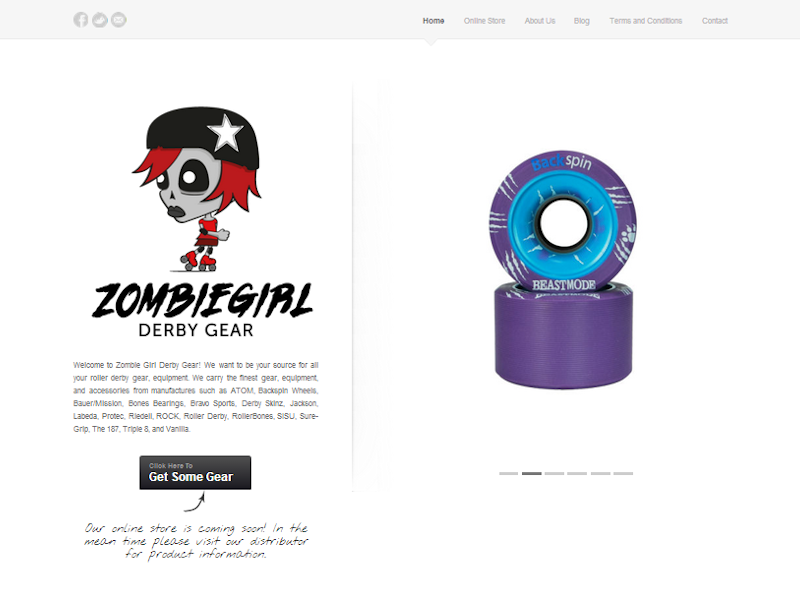 We created a simple and clean responsive website for Zombie Girl Derby Gear. We are planning on developing a ecommerce site for the company in the near future. Working with idproductions was easy, and I got the results I wanted. Jeff's vision for my website was right in line with my own, both in terms of aesthetics and functionality. I'm happy to recommend him to my friends. idproductions has always been very attentive to our needs and promptly handles any changes and issues that arise with our web site. Raul Pla Antenna World, Inc.
Our hosting plan was going to expire and we wanted to move our web site to another hosting company. idproductions was able to make the move that evening, even with extremely short notice. David Dillon Longs Homes, Inc.
Have questions? We'll answer them. © 2014 idproductions. All rights reserved.